A humbling first step before conjuring any new resolutions for the new year is to dust off the list from last year and see how many, if any, prior resolutions came to fruition, and which should be re-runs this year. Last year I had one overarching resolution: to promote the hobby/craft of woodworking and reach more “newbies.” Judging by the many emails and comments I was at least partially successful… perhaps not in creating the desire to become a woodworker, but at least in reaching a lot of new woodworkers. Speaking for the woodworking community, welcome. We are glad you are here with us! 1. Miter Saw Dust Collection. Once and for all, I want to solve this problem. It is utterly ludicrous that with our collective technological prowess we still can’t get this right. I’m going to do it… this year. 2. SawStop In-Feed Table. My Out-Feed Table has added immensely to my enjoyment and safety in using the table saw, but large sheet goods and long lumber rips would benefit from “in-feed support” and I have a design rattling around in my brain. 2016 is the year. 3. 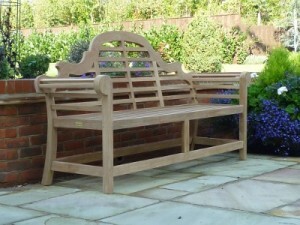 Lutyens Bench. Sir Edwin Lutyens (in collaboration with Gertrude Jekyll) designed the famous garden bench that now bears his name and thousands have since been built; some meticulously copied, some with variations, some only loosely inspired by the original. I designed my variation this year but didn’t have time to build it. This year I will. 4. Shop Space. My shop is spacious enough until you add two cameras on tripods, three light stands, and assorted other video-making equipment. I need more space. I have a plan for 2016. That may seem like a short list, but my ever-present unstated resolution is to make sure I follow through on the few I do make. No reason to set unrealistic goals and then be disappointed next year when I look back to see what was accomplished. In addition to resolutions, I have a fervent wish. I wish you a joyous, healthy, prosperous new year with more time in your shop and enough new tools to keep your desires in check, enough new challenges to keep your creative juices flowing, enough wood to work, and enough energy to use it all. Cheers, and thank you all for being good friends in woodworking! Steven Johnson is retired from an almost 30-year career selling medical equipment and supplies, and now enjoys improving his shop, his skills, and his designs on a full time basis (although he says home improvement projects and furniture building have been hobbies for most of his adult life). Steven can be reached directly via email at downtoearthwoodworks@me.com.